Help Feed The Hungry Seal Pups! You are here: Home / Articles / Help Feed The Hungry Seal Pups! The Marine Mammal Center has issued a call to action to help hungry seal pups! This spring the center has 220 pups in residence and boy, are they hungry. The elephant seal babies are the biggest of the bunch. 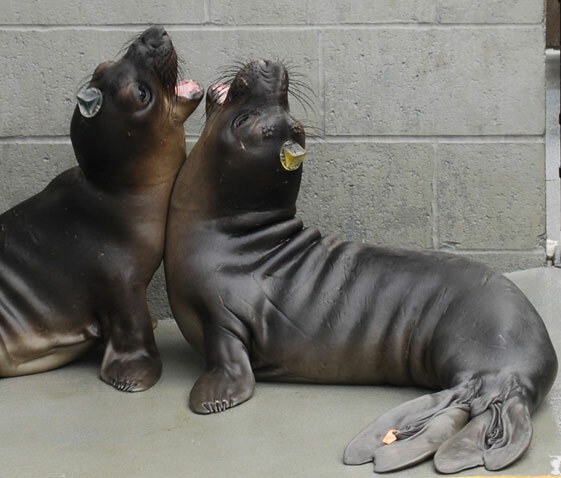 They should weigh 250 pounds by the time they are a month old, but many of the elephant seals at the Marine Mammal Center come in weighing less than half that. The sickly and injured animals that are admitted to the center need to eat more than 10% of their weight each day to get healthy; multiply that by 220 and that is a lot of fish! The center is going through 1000 pounds of fish everyday. Each pound costs $1, which means $1000 a day and $7000 a week just to feed these healing and growing pups! That’s not to mention all of their other expenses. So what can you do to help? Click here to buy some fish for these adorable pups!